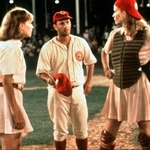 A League of Their Own is a Film programme that first aired in 1992 and has been classified a PG certificate. Comedy drama. 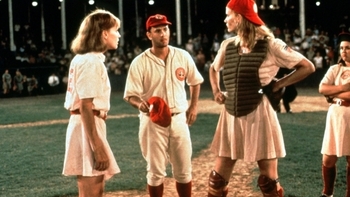 Following their success with Big, director Penny Marshall and star Tom Hanks teamed up to tell this story about women's baseball during World War II. It's 1943 and, with most men absorbed into the war effort, the owners of the teams are worried that Major League Baseball will end, taking their profits with it. To avoid this, sweets magnate Walter Harvey is instrumental in setting up the All-American Girls Professional Baseball League, which scours the USA for players. The narrative centres on the Rockford Peaches, their star players - sisters Dottie Hinson and Kit Keller - and the alcoholic former player, Jimmy Dugan, who's hired to coach the team. The Peaches have the raw talent, but will they be undermined by Dugan's initial lack of interest and the fraught relationship that develops between the sisters? When is A League of Their Own next on TV?